A discounted rate of $165.00 per night + tax will be available at the Houston Marriott Westchase. The deadline to book at this rate is Monday, September 16, 2019. You can book online or call the Houston Marriot Westchase Directly at (713) 978-7400 and mention “OilComm 2019” for your discounted rate. Contact Ashlyn Geoffrey at ageoffrey@accessintel.com with any questions or concerns. 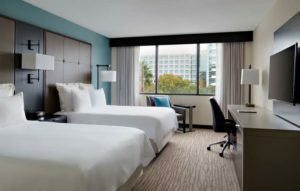 We have been made aware that certain companies are targeting OilComm exhibitors and attendees to secure your rooms at the Houston Marriott Westchase through them. Please note that these groups are in no way affiliated with OilComm and beware of their false claims of having access to hotel rooms in the official OilComm room block. You will receive information directly from OilComm regarding any legitimate housing updates. Delta Airlines: Reservations and ticketing is available via www.delta.com. When booking online, select Book a Trip, click on More Search Options and enter the meeting code, NMSMC, in the box provided on the Search Flight page. The Group Ticket Designator, if prompted, is NGKDN. Reservations may also be made by calling Delta Meeting reservations at (800) 328-1111, Monday – Friday from 7 a.m. – 7 p.m. CDT. Additional fees may apply. United Airlines: Save an additional 3% by booking your own airfare online at www.united.com. Choose your flight times and access your discount by inserting ZFXK882468 in the Offer Code box. Or call your travel professional or United Meetings at (800) 426-1122 for reservations. Refer to Z Code: ZFXK and Agreement Code: 882468. (A $25 service fee will be collected for all tickets issued through United Meetings Reservation Desk). Looking for more tips on where to hang in Houston while you’re in town for OilComm? Email Mike Conti, OilComm Show Director, and he’ll give you more ideas!